British Council Music Director, Cathy Graham, reflects on the life and music of the great British composer and conductor, Oliver Knussen. The classical music world is mourning the loss of one of the UK’s finest composers, Oliver Knussen, aged 66. A towering giant of a man physically, he was also a conductor and teacher of great stature whose contribution to the world of contemporary music is inestimable. The oeuvre he has left us is not huge but the works are perfect jewels combining complexity with immense beauty and where not one note is extraneous. For those of you who don’t know his work and would like an introduction, listen to these two short pieces from 1995. Two Organa are both based on a technique from the 12th century where slow plainchant tones are the foundation for the more rapid dancing music above. I also recommend a listen to Fanfare with Fireworks – a two-minute concert opener of dazzling brilliance – and, if you have more time to spare, his two children’s operas based on the books of Maurice Sendak, Where the Wild Things Are and Higglety Pigglety Pop. They will transport you to another world. 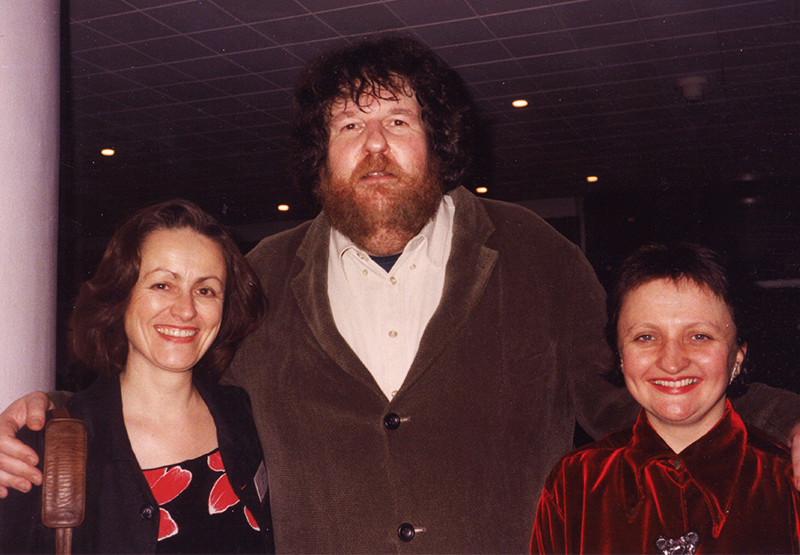 Above: Cathy Graham, Oliver Knussen and Gillian Moore, 1998 at the beginning of Olly’s tenure as Music Director of the London Sinfonietta. I worked closely with “Olly”, as he was known to everyone, over a period of nine years when I ran the London Sinfonietta with Gillian Moore, now Director of Music at the South Bank Centre. His period as Music Director gave me some of my life’s most intensive and precious musical experiences. Listening to his rehearsals was to hear and understand the music with a depth I’d not thought possible. He took the music to pieces, polished its parts and put it back together again so it spoke perfectly. His generosity to young composers is legendary. He taught, befriended, nurtured and encouraged – to have your piece conducted by Olly was to entrust it to the best pair of hands on the planet. In concert there was always the chance that he would spontaneously perform a work a second time so the audience got twice the enjoyment and the opportunity to take in more on repeated listening. He was a natural teacher and it was a privilege to hear him speak from the podium, “if the spirit moved him” as he expressed it. You could never plan for it. He could be immensely demanding, only accepting the very best. And he could be enormous fun with a wonderful store of anecdotes about his life in music and the many composers whose work he championed, from Elliott Carter in the US to Toru Takemitsu in Japan. He enjoyed good food, good wine, good company, and was a great film buff. His premature death is an enormous loss, to the world of music and to the many people who loved him. We send our heart-felt condolences to his family and to his large extended family. RIP Olly. 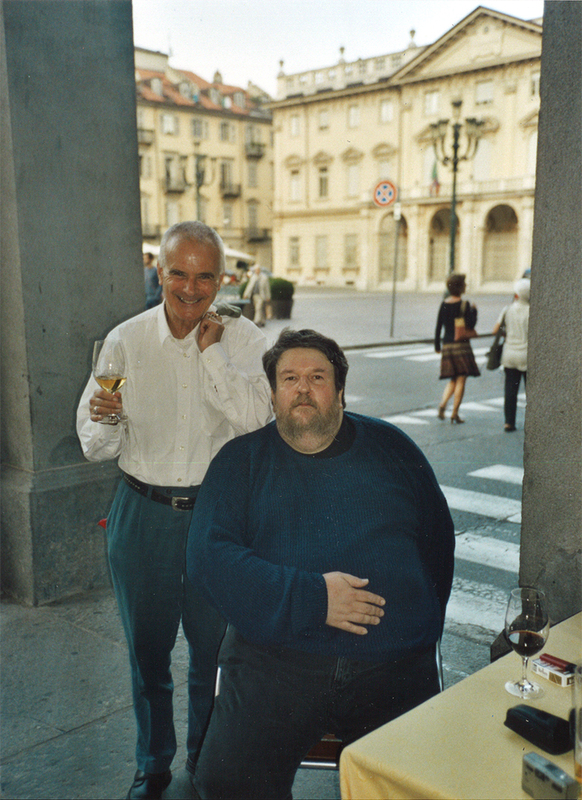 Above: Olly with the late Sir Peter Maxwell Davies, 2006, on tour with the London Sinfonietta in Turin.